The CB Cash Code Review - A Scam Or $80k/Month In 10 Min? 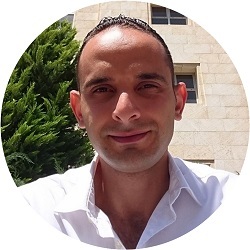 Welcome my friend to The CB Cash Code Review! 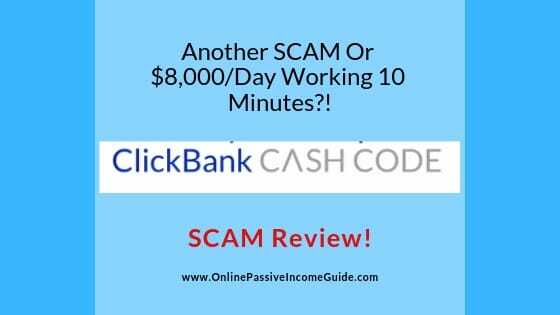 Is ClickBank Cash Code a scam or legit? This is probably the first question you asked yourself after hearing the claims in the sales video about making $80,000 per month with ClickBank working only ten minutes a day. The Guy who calls himself “George Patterson” claims that after his mother being sick and about to die, one of his relatives gave him a check of $40,000 in order to provide health care to his mother, and after a while, he asked his relative about how he makes his money, who in turn told him about the system that allows him to make thousands per day with Affiliate Marketing, working only few minutes on his phone. And now that he wants to share it with other people so that they get their freedom and enjoy their lives. And I’m sure that you felt that there’s something unrealistic about this story and about the income claims, and that’s why you started looking for The ClickBank Cash Code Reviews and you finally landed here. I will show you below, with evidences, how “George” is lying to you and misleading you and why you should be careful before you purchase this program. And don’t worry, I will let you know in the last section of this review about the right place to learn how to make money online with the same method of affiliate marketing, which is the same place where I personally learned this great method. Price: $37 for the front end. Optional upsells for $300+. Also, you need to spend on tools and traffic methods. The CB Cash Code is a system that is supposed to help you make money with ClickBank (an Online Retailer for digital products), through the method of affiliate marketing, right from day one. Even more, “George” tells you that this system that his relative shared with him is so easy to follow and apply that it can help anyone go from an internet marketing rookie into a ClickBank Pro in one night! And as someone who has already been doing affiliate marketing for not a short period in time now, I can tell you that this is completely untrue. As you will see in the few coming sections, affiliate marketing is not a method that you can become pro in it in one night or even one month. Another reason, compared to other legit affiliate marketing training programs in the industry, such as CB Passive Income and others, the training in the CB Cash Code program is not enough to become pro in affiliate marketing even in years! You will see the reasons on that in the coming sections. The CB Cash Code works by asking you to pay $37 in order to get access for some general material and guides on affiliate marketing with ClickBank in the form of PDF documents that won’t really help you make money. And after that, they will offer you to buy their upsells that cost over $300, and you still need to pay for the tools, web hosting and paid traffic methods in order to make money with the methods mentioned in the PDF guides. It is not as in the above screenshot, sorry! This material you receive in the PDF documents is enough to give you a general idea about the method, but they won’t really help you make money as there are many details in all aspects of the method that cannot be taught in a written format. You need detailed walk-through video lessons in order to learn what is required and to apply the method and get results. So, How Does The Method Itself Work? Create quality and helpful content that explains to people how these products can help them, and include your affiliate link inside the content leading to the products you found. Publish your content properly and when someone lands on it, they might purchase through your link and you get paid a commission from the product seller. And each one of these methods requires time to learn and apply consistently before you start making any money, then how about thousands a day, and right from day one?! And more important, ten minutes per day is not enough to do anything at all, you need to spend 2-3 hours per day in order to learn and consistently apply what you learn before you start making money. And more important, the material you get from The ClickBank Cash Code program is not enough to learn how to do most of the necessary work, as you will see in the following section. As I mentioned earlier, these are enough to give you a general idea on how affiliate marketing with ClickBank can be done, but they are not enough to take you be the hand and learn how to do any of the main activities from A-Z, as it is with my recommended alternative, Wealthy Affiliate. The Main Guide for example explains to you how ClickBank and affiliate marketing work, how to choose products to promote, the main terminology and stats, the different traffic sources, …etc. And it will also include some guides on how to track your traffic and conversions using some tools. And the ClickBank Book Plus document will explain to you how to leverage the social media platforms mainly in order to grow an audience and monetize it through promoting ClickBank products. And finally, The ClickBank Cash Code Secret Method is supposed to teach you how to build a personal brand through blogging and other methods and using it to make more money. The problem is that there are so many details that you need to learn in order to apply the method correctly, and these cannot be included in the mentioned PDF documents. Without watching someone while doing them in detailed, step-by-step over-the-shoulder video tutorials, you can’t make them work! Which means that you need to buy another training in order to learn how to apply what is mentioned in the CB Cash Code material. The cost of The CB Cash Code is $37 one-time-fee for the front end that consists the above mentioned PDF documents. However, you will be offered to purchase multiple upsell that together cost more than $300. For example, the first upsell you get offered costs $147 to teach you how “George” makes up to $10,000 per day with Facebook. And remember, even without purchasing the upsells, you still need to spend money on the web hosting, keyword research tools, email marketing tools, paid traffic methods, ….etc. And all of these together can cost you thousands of dollars, and you probably won’t make real money because the PDF guides are just not enough to teach you well. What is good about The CB Cash Code program is that they offer a 60-days money back guarantee, which makes it safe to try it through this link. However, remember that they don’t compensate you for what you spend on the tools and the paid traffic, and most important, for your time. Go to the last section below in order to learn affiliate marketing from the #1 program in the industry! It is about affiliate marketing, which is my favorite way of making money online. They offer a 60-days money back guarantee. You will probably need it after you discover the lies about the income promises. They tell you that you can become “Pro” with ClickBank affiliate marketing in one night, which is completely unrealistic. And worst, they tell you that you can make up to $80,000 per month working only 10 minutes a day! And that many people have already made more than $20,000 in their first week with this system. These are just lies that they use in order to sell scams and low quality programs that don’t deliver the mentioned results to people who know nothing about making money online. Every method of making money online requires you to put some time in advance on consistent basis before you start making any money, including affiliate marketing, the most newbie-friendly method and my favorite method. The people you saw in the video on the sales page of the CB Cash Code program are just actors that you can hire from a freelancing platform that is called Fiverr for few bucks. The screenshot below for example is for this lady’s profile on fiverr.com. If The ClickBank Cash Code delivers the mentioned results, then why wouldn’t they bring real testimonials by real students instead of fabricating them?! I think this is an enough reason not to trust these guys, but let’s continue! 3 – Who Is George Patterson? The guy who speaks in the video and claims to be the founder of The CB Cash Code doesn’t show his face. And if you google him, you might not find someone relevant with the same name. If he was really successful and can really teach you how to make money with ClickBank, then why doesn’t he show you his face?! 4 – Pay For What? For the PDF guides that leave you nowhere?! Upsells for probably more than $300, and you still need to pay for the tools, web hosting, traffic and ads, ..etc. Although this is not what they promised in the video! They always tell you that this might be your last chance to join the program, but if you come in next month, you will probably here the same stuff. Usually, this tactic is used in order to invoke you in order to take action without thinking and without looking for reviews before you buy the program being promoted with this method. They show you screenshots for affiliate commissions and tell you that these are all profits. But the fact that they tell you to use PAID traffic methods, and you need to spend on tools and web hosting, then these results you see are not the profit as you still need to cover your costs from this money. Who Is The CB Cash Code For? The CB Cash Code is for George Patterson to make money from you. And it is for everyone who wants to get a general guide on affiliate marketing with ClickBank without learning what it takes to make real money. The support for The ClickBank Cash Code program is available through email on their website. Conclusion – Is The CB Cash Code A Scam Or Legit? The CB Cash Code is not a scam since you actually get something in exchange of the money, even though it is useless in my opinion, and hence, the low rating I gave above. However, just because they give you something in exchange of the money doesn’t mean that you have to purchase The ClickBank Cash Code program as you will end up wasting your time and losing money on the tools and the paid traffic without positive results. But still, I encourage you to learn affiliate marketing as it is really the best way to make money online, but I want you to learn it from the right place. Is There A 100% Legit & Proven To Deliver Alternative To The CB Cash Code? As I explained earlier, affiliate marketing is a legit method of making money online and I encourage you to learn it and apply it like I personally do. But I want you to start with the right mindset and the right guidance from the beginning. Which is why I’m recommending to you the best training platform in the industry, Wealthy Affiliate. This platform will provide you with all what you need in order to learn and build your business. You will find at this alternative not only the detailed step-by-step training, but also the tools you need, the web hosting with the technical support, the community support and much more. All in one place for NO Extra Cost. And don’t worry about risking your money, they also offer a Starter Membership so that you can try it for FREE before paying anything. This is only the free level that will allow you to understand how this method works the right way, and will allow you to start your first FREE website and start adding quality content that helps others and makes you money. This level alone, with the tools and web hosting you get, is worth much more than what you get with the front end of The CB Cash Code that costs you $37 WITHOUT tools! You can stick to this level or you can upgrade anytime in order to unlock the advanced training levels, tools and support. So, if you are ready to take consistent action and build a long term and sustainable business, then go ahead and..
==>Click Here To Join Wealthy Affiliate Through This Review! Go and start taking action now and stay away from the programs that overpromise and don’t deliver with their push button solutions.